Discover 10 easy ways how a “spring cleaning” for your body, better known as a “detox,” enhances overall energy and vitality. It’s that time of year again. Time to organize the closets, tackle the garage, and clean out your system. No, I’m not talking about your computer system, but rather your body’s system or systems to be more accurate. 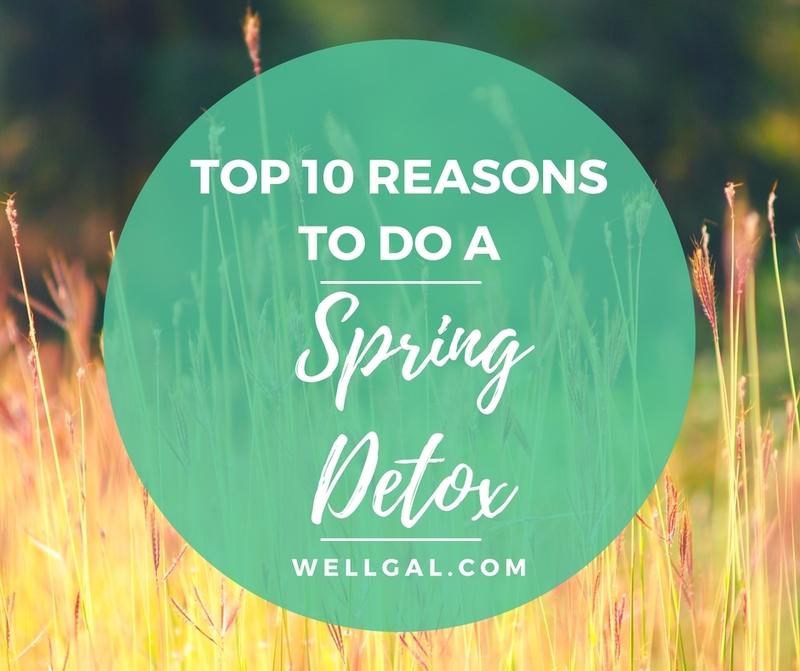 Most holistic health practitioners advocate doing a “spring cleaning,” better known as a “detox” this time of year since it enhances overall energy and vitality. Also, many spas offer programs with a focus on detoxing, healthy eating, and purification, but you don’t need to retreat to a spa to do a detox. It is something you can easily do at home. And it’s rather easy to do with the guidance of a qualified health practitioner. Many people experience clearer thinking, feeling “lighter,” and having more energy and vitality after they detox. You’ll feel like “springing” forward with a renewed mind, body, and spirit! On a day-to-day basis we breathe in pollutants from household chemicals, second-hand smoke, etc., and unknowingly ingest pesticides, preservatives, metals, and other chemicals through our food and water. We may also take in harmful chemicals (e.g., parabens) through our skin from unorganic body care products, such as lotions and deodorants – even though scientific research is still being done to determine the extent of this. In addition, our body produces waste from its own metabolic processes. When these toxins and wastes accumulate, we can have problems such as unexplained fatigue, digestive problems, hormonla disruptions, unclear thinking, etc. To help the body detox, special herbal combinations can be taken to support the processes of the kidneys, liver, gastrointestinal tract, and lymphatic system. Since the focus of most detox diets is eliminating all the junk (e.g., diet sodas, processed food, sugar-laden treats, alcohol, red meat, etc. ), you give your body a chance to enjoy the simple pleasure of fresh fruits, vegetables, nutrient rich grains, and legumes. Also, since you’re not drinking caffeinated beverages, diet sodas, or alcohol, you get to focus on the most nourishing beverage of all — good old, pure H20. If you can’t stomach plain water, try a healthy spa water, such as cucumber-mint. When you find you are eating healthier and eliminating toxins, your weight will go down most likely. The best plans don’t “starve” you, but rather allow you to eat all the healthy fruit and vegetables you crave, while allowing you to still take in the amount of protein, healthy fats (e.g., flaxseed oil), and grains your body requires to feel full and energetic. Any healthy detox plan promotes daily exercise. So, if you’ve been neglecting a simple daily walk or a visit to your local gym, now’s the time to start again. Your lymphatic system, which is like your body’s “waste disposal system,” moves into action with muscular movement and deep breathing; it can also be stimulated with dry skin brushing. It’s essential that you move to help eliminate the toxins from your body, but it is important that you don’t overdo it. Start with something like gentle yoga. It helps not only a physical level, but a mental and spiritual one as well. Most detox plans have you abstain from foods which may cause allergies or food intolerance in some individuals. Eggs, soy, corn, wheat, dairy, nuts, seeds, alcohol, etc., are often all on the “no-no” list; however, some people still eat yogurt due to its probiotic benefits while detoxing. When you are done with your detox, you then reintroduce these foods one at a time and monitor if you have any kind of reaction (e.g., bloating, digestive upset, headaches, fatigue, mood changes, etc.). If you do, it’s a food you may need to eliminate altogether from you diet or have only occasionally. It’s so easy to get all wrapped up in that comfort food or glass of wine we automatically reach for to relax, that we forget we really can do other things instead. Going on a detox helps you eliminate mindless eating, drinking, and food cravings. All of a sudden you have time to think about what you can do that’s good for you and different and that will help promote health in the long run, not just be some quick fix. Many detox diets suggest the addition of a few healthy supplements in addition to healthy food. Some of these supplements, such as fish oil and flax oil, can continue to be used long after your detox diet is over. Also, learning about and trying herbs that help “cleanse” our body systems is something important to do in this world of acute and chronic diseases we have not yet found cures for. For example, understanding that milk thistle is an herb related to the artichoke and is great for cleansing the liver, may prompt you to eat more artichokes when your detox diet is over. A detox isn’t just about detoxing those “things” our body doesn’t need. More holistically, it could be thought of as a way to eliminate toxins, negative thinking, and needless activities from our daily lives. Giving ourselves some time to meditate and clear our head is necessary. Realizing it’s important that we get a massage or a spa treatment to renew ourselves once in a while is important. Eliminating some items off the “to-do list,” essential. When you eliminate heavy proteins (such as red meats), potential food allergens, sugars, junk food, etc., you give your digestive system a break and allow your body to eliminate what it doesn’t need — with the help of plenty of water and additional cleansing herbs. Make sure you are drinking filtered water that contains the minerals your body needs as discussed in this post. No doubt eating raw vegetables and brown rice every day for lunch the entire length of your detox diet could be downright boring. Going on a detox challenges you to try new spices and seasonings (e.g., turmeric), cook with new grains (e.g., brown rice, amaranth, quinoa), incorporate healthy proteins (e.g., fish, lentils), and experiment with healthy food combinations. Note: Several different approaches exist, so it’s best to get guidance from a qualified health practitioner and to get your doctor’s approval if you are currently facing any health conditions. Also, I have found that many of the natural products stores have excellent staff on hand that can point you in the direction of good products and well written books on the subject. Updated on March 29, 2017.